Pigs constantly communicate with each other. They have a range of different oinks, grunts and squeals which have distinct meanings. Pigs are extremely social animals. They form close bonds with other individuals and love close contact and lying down together. Pigs are very clean, keeping their toilet area far away from where they lie down and eat. Even newborn piglets will leave the nest to go to the toilet within hours of birth. Pigs are very peaceful animals, rarely showing aggression. The exception, as with many animals, is when a mother (sow) with her young offspring is provoked or threatened. Wild pigs play an important role in managing ecosystems and maintaining biodiversity. By rooting, and thus disturbing the soil, they create areas for new plant colonisation. They also spread fruit plants by dispersing their seeds. Pigs have a tremendous sense of smell. The large round disk of cartilage at the tip of the snout is connected to muscle that gives it extra flexibility and strength for rooting in the ground. There are numerous stories of pigs that have saved the lives of humans. For example, a pet pig called Pru pulled her owner out of a muddy bog, and another, Priscilla, saved a young boy from drowning. 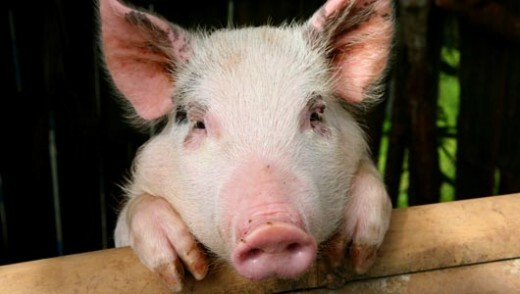 The pig is the last of the 12 animals in the Chinese zodiac. The pig is seen to represent, fortune, honesty, happiness and virility. The meat of pigs is widely eaten by people across the world. Many people who consume animal products would like to choose products from animals kept in higher welfare systems. However welfare labelling on products can be confusing.